★★ THE NICE WEGHT PERFECT FOR CROSSFIT★★ Whether you are a fitness expert or beginner, you will love the jump rope, there are two cables to choose from,one is the same thick(2.5mm thick) as the others and the another is thicker(5mm thick) than the common cables, so you will get the PERFECT weight FOR YOURSELF to master all techniques. 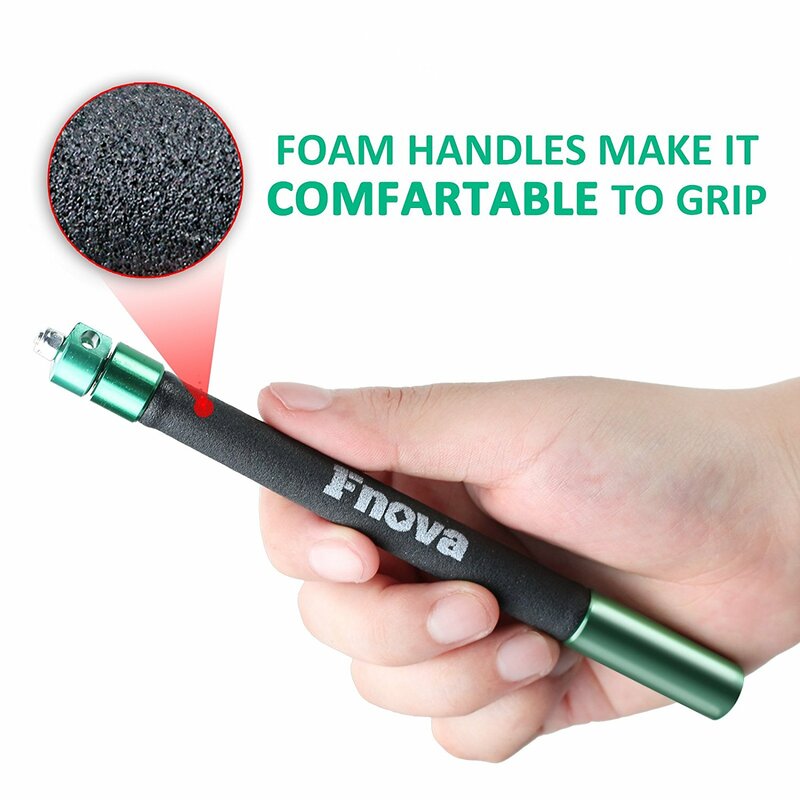 ★★ HIGH QUALITY - BULID TO LAST★★ Extra long 6 inches extremely light aluminium alloy handles with comfortable foam grips guarantee to withstand heavy use and better feel in the hand.The cable is made of braided steel wire coated in PVC so it is durable and smooth. 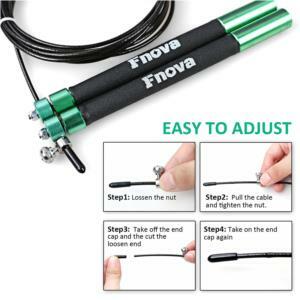 Geat jump rope that you will love. ★★ EASY TO ADAJUST SUIT FROM CHILD TO ADULT★★The jump rope has a 10ft long cable that is fully adjustable, cut it to a fit length for your height in seconds, it's perfect for men and women of any height. ★★ PROFESSIONAL SPEED BEARING★★The unique Dual-ball bearing of the jump rope provide high RPMs with tangle free operation, perfect for double unders, it aslo means no twisting, and delivers smooth movement every time great for CROSSFIT, BOXING MMA, OR WRESTLING. ★★ BONUS ATTRACTIVE REPLACEMENT PARTS★★You wil like the carrying pouch the jump rope comes in, that helps keep your gym bag organized. the extra replacement parts are great as you never know when the hardware is going to missing. Of course, the answer is “ a great jump rope”, it means: a nice weight, a perfect length, a comfortable handle and a premium bearing. All the factors are our rope designed from. The Fnova speed jump rope has two different weight cables, one is 2.5mm thick like others, one is 5 mm thcik more weightier than common cables on the Amazon market, so you can get a nice weight to master all techniques. 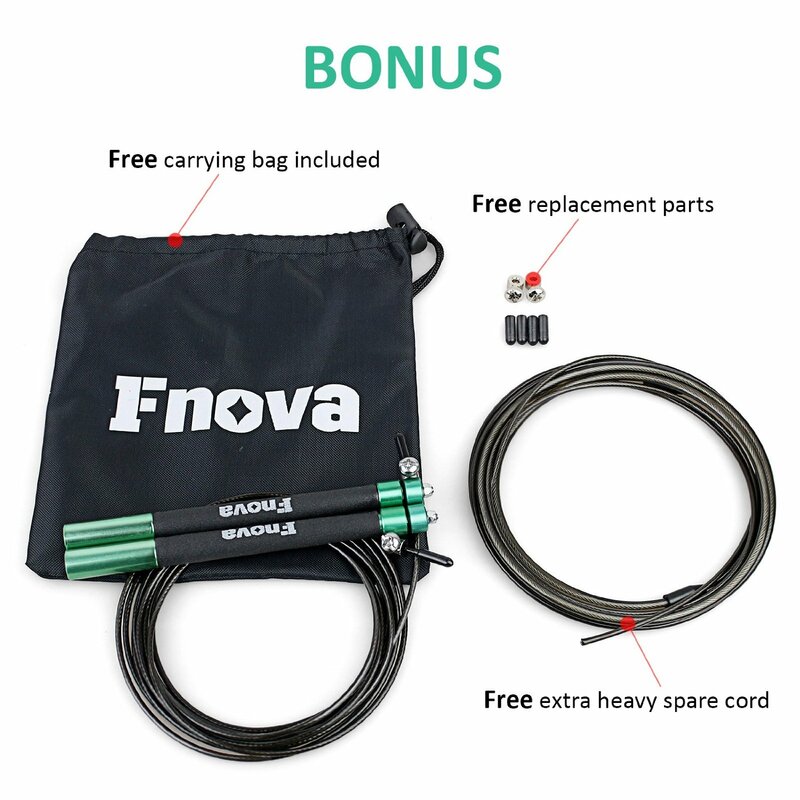 Maybe, you will find there are many cheaper junp ropes than Fnova’s on the market, but as a result: you get what you pay for. 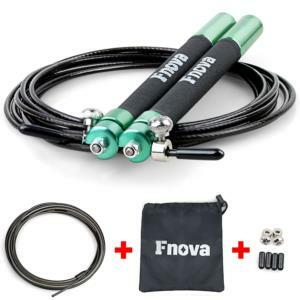 You’ll really like this jump rope, with wich you can perform double unders so you can practice for the crossfit sessions. 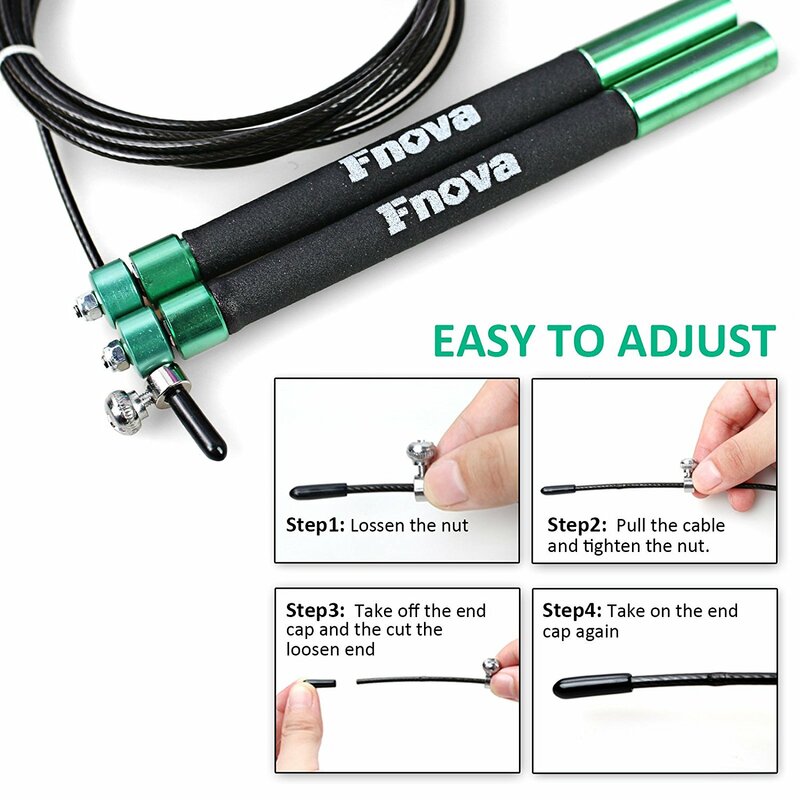 The fact that you get the best jump rope for your exercise routines. What are you waiting for? You can’t miss this great jump rope. 100% SATISFACTION GUARANTEED - if there is an issue with your product for any reason, we will REFUND you and SEND YOU A NEW ONE. CLICK THE BUY BUTTON – WHY NOT Get one for your family members too? Extra long 6 inches extremely light aluminium alloy handles with comfortable foam grips guarantee to withstand heavy use and better feel in the hand. 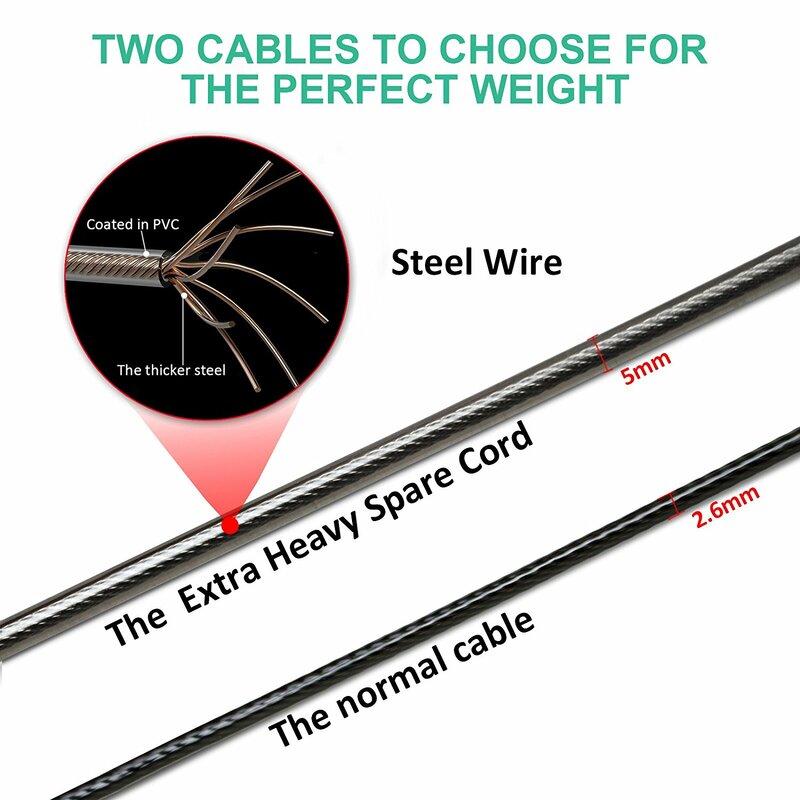 The cable is made of braided steel wire coated in PVC so it is durable and smooth. I bought this for me and for my family for exercise. It is easy to grab a jump rope and Exercise!! Below are the pros and cons I found: The handles are well made. It is easy to grab it because of the adequate length. I do not know what kind of material it is in the middle part of handles, but it prevent you get slippery from your hand. I love it! Also the handles have a rotate mechanism that turns as the rope turns so you don't get tangled.The weight is perfect to me. If you have a wrist problem, do not worry!. You would not feel any weight of this rope when you are using it.The cable is a good quality, and you can cut the rope if you needed.The cable is easily adjustable. You can adjust the rope by unscrewing the screw which are by the handle to the right length and cut the cable if needed. It does have little plastic end caps that protect you from the sharp end if you do cut it off.The rope is looked a little bit of difficulty of cut to me when I need it but you can adjust the rope without cutting. No problems. 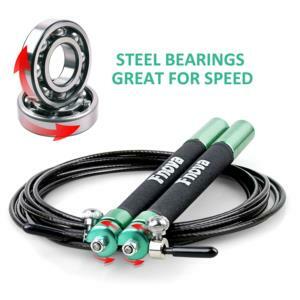 The rope is wire, so It would hurt when you get hit by this.Overall, I am pleased with this product.I got a discounted offer for this product in exchange for my unbiased and honest review. This jumping rope is wonderfully constructed. It is made with extreme durability and a lot of special attention to its construction. The handles are small, making it far easier to use than the big and bulky ones that you typically see. The handles have a metal piece at the end that helps both handles spin so you only need to spin your wrist and not your entire hand and arm. It moves extremely smooth and has a long wire that works great for us taller people. And I love how this jumping rope does not get tangled because of the wire. However, it can also be adjusted for any height, including children. There is a replacement wire and hardware if for some reason the wire breaks; however it is unlikely it will break. To top it off, it comes in a cute little gym bag that shuts easily and can be stored anywhere without losing the spare parts.I was given a discount for this product for my honest and unbiased review. Fnova jump rope really is a premium quality jump rope!